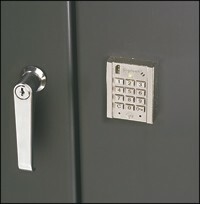 Add extra strength and security to your storage system with the convenience of electronic lock management (Pic. 2). 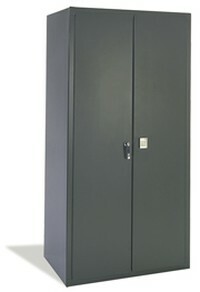 Program multiple cabinets with similar or distinct codes to effectively maintain security measures. Three-point locking system is anchored by electronic lock which includes 1/2” deadbolt. Each cabinet also includes a programming bypass/master key, and can be programmed individually for multiple users to manage access in single or multiple cabinet applications. The three interior shelves are adjustable at 4” increments.